Here in the Northern Eifel region, the longest battle raged that had ever taken place on German ground during World War II. Although the Americans, after the breakout from Normandy, had already reached the Westwall (the so called "Siegfried Line") near Aachen on September 11, 1944, they did not succeed in crossing the Roer River heading for the Rhine before the end of February 1945. Division after Division was sent into the "Huertgen Forest", as the Americans soon called the state forest between Stolberg and Monschau. Casualties were high 1 and territorial gains were small--more like the static warfare of Word War I than the quick advances achieved during the weeks before. For the Huertgen Forest and its communities, the heavy battles meant their total destruction. For decades after the war, mines continued to be salvaged from the woodlands. Equally, remains of victims from both sides were still being recovered long after the war. Even today you will find vestiges of combat in the forests, blasted bunkers, overgrown grave systems, and dangerous dud ammunition. In a Europe that slowly loses the remembrance of its bloody history while getting involved in new crises, keeping awake the past is a task of particular importance. In addition to the battlefields in Normandy and in the Ardennes, the combat sites of World War I in the Argonnes, at the Somme, and in Flanders, the Huertgen Forest serves as a powerful reminder for peace, an appeal against war as a politicial means. (1) Military actions at the Westwall up to December 15, 1944 alone brought death, injury, or captivity to over more than a quarter million soldiers from both sides. Source: Office of the Chief of Military History, US Army, "The Siegfried Line Campaign": 1st and 9th US Army--57,039 battle casualties (dead, wounded, captured, missing in action); 71,654 non-battle casualties, i.e. accidents, diseases such as pneumonia, trench foot, frostbite, and traumata. German Armed Forces presumably 12,000 dead, 95.000 captured (documented), and an unknown number of wounded. 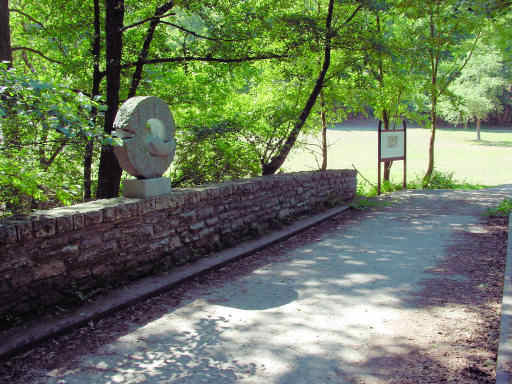 Across this way, the so-called “Kall Trail”, troops of the 28th US Infantry Division pushed forward at the beginning of November 1944 to capture the village of Schmidt. After a few days, the so-called "Allerseelenschlacht" resulted in a disaster for the Americans. As surviving American troops tried to retreat across this bridge to Vossenack, great parts of the Kall Valley were already cut off by the Germans. From November 7 to 12, the German regimental doctor, captain Dr. Guenther Stuettgen, managed to negotiate an unofficial ceasefire with the Americans here at the Kall Bridge in order to attend to the wounded of both sides. In this way, the lives of many G.I.s could be saved by German paramedics. After the war, Dr. Stuettgen was honored by the Governor of the State of Pennsylvania for this act of humanity. 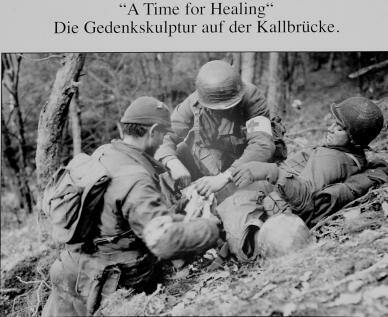 This incident at the Kall Bridge is documented in the Museum of the National Guard on a painting entitled "A Time for Healing". 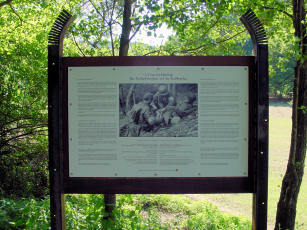 On the "Kall Trail's" upper part, there are still remains of the American casualty station depicted on the painting. A replica of that painting is placed at peace museum in Vossenack. This sculpture created by Michael Pohlmann recalls that moment of humanity amidst the horrors of war. It was officially dedicated on the 60th anniversary of the ceasefire on the Kall Bridge, November 7, 2004. "I didn't want to create a monument to heroes, no theatrical representation, no pathos, but wanted to appear more unassumingly with a frugal shape, hewn in stone, dignifying the actual place of the incident. A place perhaps, at which once everything may have started rationally, then however, became more and more irrational and totally out of control until a return to sanity--or was it still emotion?--made a humanitarian encounter come true." 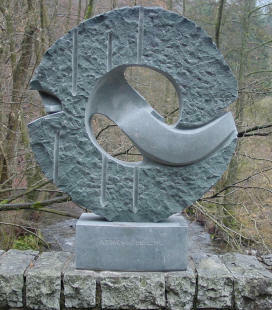 The plaque was created by the sculptor Tilman Schmitten, Eupen.